Despite the deposition of Wells Fargo (WFC) employee Herman John Kennerty, in which he admits to signing off on foreclosure documents without verifying anything but their dates, Wells Fargo continues to insist it doesn't have a documentation problem of the sort admitted to by its competitors, GMAC (GMA), JPMorgan Chase (JPM), Bank of America (BAC) and OneWest Bank. Consumer bankruptcy attorney Thad Bartholow defended the Guevaras in U.S. Bankruptcy Court against Wells Fargo's claims that they owed $18,600 in mortgage arrears and fees. To prove that claim, Wells Fargo offered a sworn statement signed by employee Tamara Savery that Wells Fargo owned the Guevaras' mortgage. After Bartholow pointed out that Freddie Mac claimed to own the mortgage, Savery signed a second sworn statement swearing that Freddie Mac owned the loan and Wells Fargo serviced it for Freddie. When Bartholow deposed Savery and asked her how she could swear to two contradictory things, Savery admitted she neither prepared the documents nor verified their contents before signing them. Given Savery's conflicting testimony, the bankruptcy judge refused to take her word about the servicing arrangement, and asked Wells Fargo to produce the servicing agreement or other "competent" evidence. But the bank either couldn't, or wouldn't, produce the agreement, and the bankruptcy judge disallowed the $18,600 claim. Wells Fargo appealed to U.S. District Court, and on Aug. 18, Senior U.S. District Judge Royal Furgeson affirmed the bankruptcy court's decision, meaning Wells Fargo lost that $18,600. The bank didn't appeal further. Reports on the document crisis have rightly pointed out its potential to slow down the foreclosure process and further damage an already-dismal housing market. But there's another possible outcome: meaningful mortgage modifications. If instead of being pushed into foreclosure, more homeowners could stay in their homes and make affordable mortgage payments, the supply of homes on the market would shrink, helping to stabilize the housing sector. And mortgage modifications can be done as quickly as banks wish -- without lying to courts. Speaking of courts, a primary part of the foreclosure crisis -- the scarcity of meaningful loan modifications -- relates to a problem with current U.S. bankruptcy rules. A debtor in bankruptcy can force a bank to accept a write-off of principal and term modifications for certain kinds of loans, in a process called a "cram down." A cram down allows the judge to revalue the secured loan to the present market value of the asset -- a change that would be crucial to so many underwater homeowners. The remainder of the debt doesn't disappear, but it becomes unsecured, and only gets paid off the way other unsecured debt, e.g. credit cards, does. Cram downs are available for car loans, yacht loans, vacation homes, investment properties -- almost any secured asset imaginable. Almost any except one -- the mortgage on a primary residence. Cram downs aren't available to save the homes of the millions of Americans who only had enough money to buy one house. Why not ? Because banks told Congress horror tales about what would happen if the dreaded cram down option was extended to primary residences. But new research from the Cleveland Federal Reserve shows those claims are grossly exaggerated. According to its analysis, none of the nightmares banks forecast came to pass in the context of allowing cram downs to save family farms. Instead, banks avoided cram downs by making meaningful mortgage modifications with the farmers. Indeed, cram downs of primary home mortgages were allowed nationally until 1978 and in some jurisdictions through 1993, when a U.S. Supreme Court decision eliminated the practice. So it's not as if the American residential market has no experience with cram downs. As the Cleveland Federal Reserve showed, forcing banks to negotiate in the shadow of cram downs would divert much of the flood of soon-to-be foreclosed properties from the market. And without a deluge of foreclosures to process, banks would not be tempted to short-circuit court procedure with robo-signed documents. That's not to say the document problem would go away: Not only are current and past foreclosures jeopardized by it, but ultimately, good chains of title need to be established for every property. But with the time pressure eased by modifying mortgages, banks should be able to parse out those title chains far more accurately than they are now. 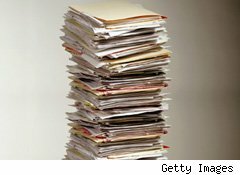 Some in Congress understood how useful cram downs could be to solve the crisis, but were unable, after bitter fighting, to make cram downs an option for primary homeowners: Too many in Congress sided with the banks instead, and the Obama administration never took up the cause. Perhaps now that the banks' fraudulent document problems have been exposed, Congress can try again. Hey Democrats: It seems like you could use a good issue. Pushing to give Americans a way to negotiate fairer values for their mortgages is probably good politics heading into this election.